Pfizer (NYSE:PFE) generates its revenues from its Oncology, Cardiovascular, Anti-Infective, Alimentary & Metabolism, Neuroscience, Immunology drugs, along with its Legacy Pharma, Consumer, Biosimilar & Other segment. Legacy Pharma, Consumer, Biosimilar & Other accounts for more than one-third of the company’s total revenues. We believe that Pfizer’s future growth can largely be linked to two segments – Oncology, and Legacy Pharma, Consumer, Biosimilar & Others. 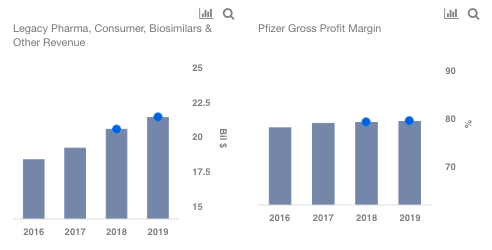 Both of the these segments have seen strong growth in the recent past, and this trend is expected to continue in the near term and beyond, led by both, a ramp up in sales of existing drugs, and new drugs from Pfizer’s late stage pipeline. We have created an interactive dashboard ~ What Are Pfizer’s Key Sources of Revenue. You can adjust the revenue and margin drivers to see the impact on the company’s overall revenues, earnings, and price estimate. Legacy Pharma, Consumer, Biosimilars & Other revenues have seen strong growth in the recent quarters, primarily led by Eliquis, which is seeing strong growth amid market share gains. The drug now accounts for more than half of the prescriptions in the NOAC (novel oral anticoagulant) market. So far in 2018, Eliquis has seen around a 40% jump in sales, and it is expected to continue to grow at a strong pace in the near term. Apart from Eliquis, the segment’s future growth can primarily be attributed to its biosimilars, some of which are currently in the late stage pipeline. Pfizer’s biosimilar Inflectra is seeing growth in Europe, and it will likely gain some market share from Johnson & Johnson’s blockbuster drug Remicade. The company is also testing biosimilars for blockbuster drugs, including Herceptin, Rituxan, Humira, Avastin, and Epogen & Procrit. Note that these biosimilars have a potential of generating more than $10 billion in peak sales. Some of these biosimilars will likely see regulatory approvals and drive future segment revenue growth. We currently forecast a mid-to-high single digit revenue growth in the near term, primarily led by the ramp up in Eliquis sales. Oncology drugs contributed around 10% to the company’s total revenues in 2017. 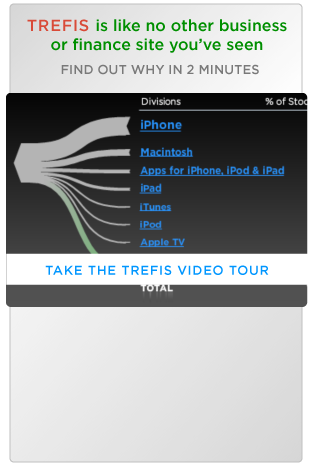 However, it accounts for close to 20% of the company’s value, in our view. This can be attributed to the higher proportion of revenues and profits expected in the coming years. In fact, we forecast the revenue contribution from Oncology to double by the end of our forecast period. Pfizer’s key oncology drug, Ibrance, which is used for the treatment of breast cancer, is seeing strong growth with sales of over $3 billion in 2017. We forecast the sales to grow north of $5 billion in the coming years. Note that breast cancer is the most prevalent cancer type in women, and Ibrance thus targets a large patient pool. Apart from Ibrance, Pfizer has a strong Oncology pipeline, which includes new drugs, such as Dacomitinib and Talazoparib, which will aid the future growth. However, Neuroscience drugs will likely see double digit declines in the near term, and beyond. Pfizer’s drugs in this segment include, Lyrica, Effexor, Zoloft, Pristiq, Neurontin, Xanax/Xanax XR, and Relpax. Looking at the past years, Neuroscience revenue increased from around $5 billion in 2009 to $7.5 billion in 2014, primarily due to growth in Lyrica. However, the figure declined in subsequent years, amounting to $6.4 billion in 2017, as Lyrica lost its EU patent. Note that Lyrica is an important drug for Pfizer, and generated over $5 billion in 2017 sales. Going forward, we expect the segment revenues to continue to decline, as Lyrica’s patent exclusivity in the U.S. will also end by the end of this year. Having said that, it should be noted that the company has one new compound – Tanezumbab – which is currently being tested in late stage pipeline. However, its peak sales are estimated to be only $500 million. We currently forecast adjusted earnings of $2.95 in 2018, and a price to earnings multiple of 16x, to arrive at our $46 price estimate for Pfizer.